Archeologists say Trefael, a standing stone near Newport south-west Wales, was used as a ritual marker to guide communities through a scared landscape. 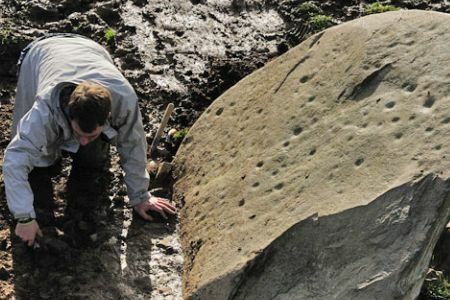 Studies showed that the cupmarks gouged onto the solitary stone represent a section of the night sky that includes the star constellations of Cassiopeia, Orion, Sirius and the North Star. There are more than 75 cupmarks on the stone, which were revealed through complete exposure of the stone during recent excavations, Archeo News reported. Until 40 years ago archaeologists assumed that the stone was part of a capstone covering a small burial chamber. Later geophysical surveys unveiled the remains of a kidney-shaped anomaly, looking like remnants of the cairn that once surrounded the chamber, with an entrance to the east. Excavations confirmed the site to be a portal dolmen, also exposing a cairn deposit within the eastern and northern sections of the trench. A clear vertical cut was also found in section, which was parallel with the dip of the former capstone. This showed that the cairn had been excavated into and the capstone set and packed within the existing cairn, probably used as a standing stone during the Early Bronze Age when new burial-ritual monuments were introduced in Western Britain. Archeologists found medieval and post-medieval pottery shards and two Mesolithic shale beads. They are planning to conduct further excavations in the area to assess the later prehistoric landscape setting and a contour survey of the monument.